Over 4,000 U.S. workers die on the job every year. While new wearable technologies are aggressively entering consumer applications, industrial safety equipment has not seen a fundamental innovation in the last decade. 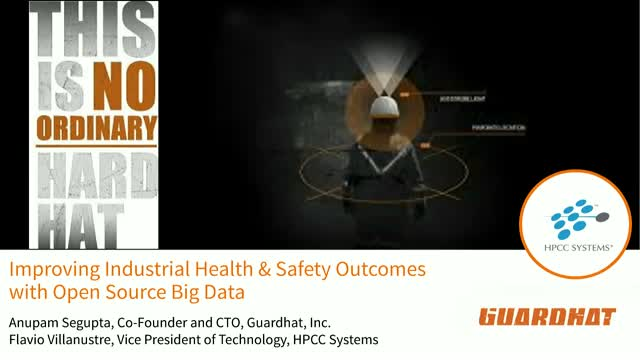 Join us to learn how Guardhat CTO Anupam Sengupta and Guardhat use open source big data technology to address this issue with its “smart hard hat ecosystem”, an industrial wearable that uses IoT and wireless communications systems to protect and empower industrial workers. In this webcast, Flavio will give an overview of the completely free, open source HPCC Systems big data platform. • Allow real-time complex event processing of vast amounts of streaming data. • Enable horizontal scaling on commodity hardware, with the flexibility to deploy both on premises and in the cloud. • Support big data analytics including the ability to analyze, identify, and predict trends.